Summary: Dr. Vit Skala, founder of the project School Can Be Fun, announced that he’s published an e-book “School Can Be Fun: Step in a New Perspective of Your Life”. This book for high school and college students is based on personal experience of this father of two young adults, who himself successfully studied two different universities and got Ph.D. in his forties. 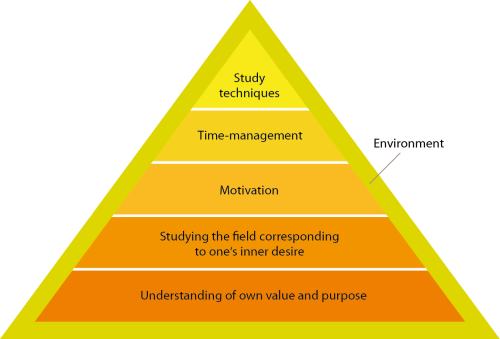 Contrary to many other similar books about an effective study, students habits, positive attitude to life this book bring comprehensive approach based on own pyramid approach. When you understand your value and purpose, you can easily find the field you should focus on during your study. It is a fundament for strong long-term motivation. You can add some other motivators and together with appropriate time-management the proofed study techniques will be helpful tools in your hands. It is a small taste of a philosophy of the book. The environment can support students in their growth or can hinder them to move on. In the first chapters, readers can explore themselves a little bit by leading to online test discovering individual learning style and strong and weak parts of reader’s natural abilities. It continues with explaining the meaning of goal setting and how to set the goal a one would like to fulfill. The reader will understand a difference between long-term and short-term goals, will be able to save time by maintaining priorities and avoiding distractions. Effective study techniques are described at the end of the book as well as methods of facing to huge challenges. In the comprehensive book, a chapter about healthy lifestyle cannot be missed. The book is available for all Kindle devices. It can be read on almost every smartphone. Good reading for travels to and from school, short free time slots or for night reading in bed before getting sleep. ‘School Can Be Fun’ is a project founded by Dr. Vit Skala. With his knowledge, skills and experience, he has developed a few learning techniques, through which he is helping students with academics worldwide. The details about enrolling for the program are mentioned on the following website.